2018 couldn’t be off to a better start! 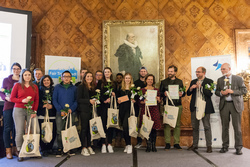 Last week the Hamburg City Hall hosted the final round of the Hamburg! Handelt! Fair! competition. The aim of the competition is to raise awareness on fair trade products and to implement effective marketing strategies to promote them on the market. 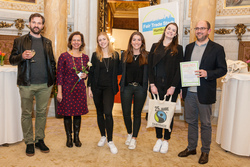 Six teams of students from six local universities worked hand in hand with Hamburg-based companies that sell fair trade products and came up with thorough market research that were presented on January 11, 2018 before a 10-member jury of businesses and local associations. We couldn’t be happier and prouder to announce that the students from EBC Hochschule Hamburg, supported by our German publisher GOLDBEK, won the first prize! Astrid, Lea, Laura and Sylie provided a very accurate insight on how FairMail and Goldbek could improve our online brand awareness and visibility. On behalf of the whole FairMail family, congratulation on your achievement, girls! !